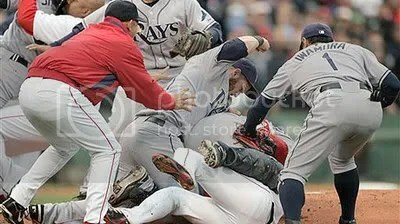 Another epic piece to the surprising puzzle that was the 2008 Rays team. For the first time in their history, a position player has won the Gold Glove Award, an accolade bestowed upon 1 player at each position for defensive excellence. This year, Carlos Pena, the Rays’ charismatic, dependable but gradually balding first baseman has won this years AL award for first base! He only committed and unprecedented 2 errors the entire year! Congratulations to Carlos! He cares because he doesn’t smoke! You can take those rally caps off. They’ve done it again. The ninth walk-off victory of the year may have been the most surprising. I mean, I must admit, going into the 9th, I had the loss penciled in on The Rays Page. How wrong I was. Down 7-4 going into the bottom half of the 9th, the Rays managed to score 6… yes, SIX runs to pull off an improbable win. 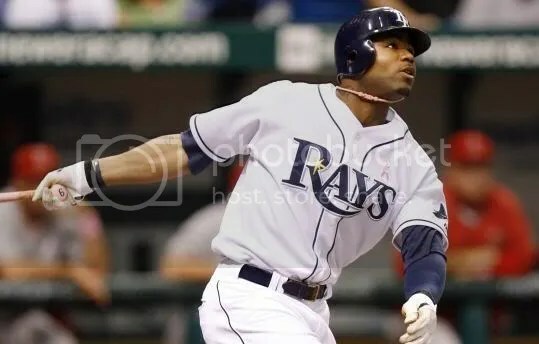 Thanks to doubles from Jason Bartlett and Eric Hinske, a determined hustle down the line from Akinori Iwamura resulting in him beating out a close play at first, and a four pitch walk to Ben Zobrist, the Rays had the base runners needed to begin chipping away at Cleveland’s authoritative lead. The rest of the responsibility was left to Gabe Gross and Carlos Pena to deliver in the clutch. And they did. 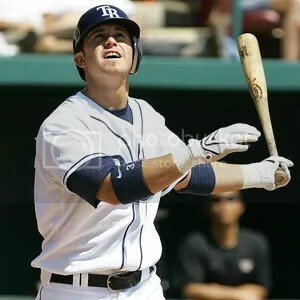 Gross hit a gargantuan home run off the bottom of the video board in right field to tie the game at 7, while Pena hit the walk-off shot over the center field wall, sending the Tropicana Field faithful into a frenzy. (27,000 at an afternoon game? I am impressed!). Up next for the Rays is a 10 game, 11 day road trip. Brutal. THIS will be one of the most critical stretches of games for the Rays, who, while as of late have been an improved road team, aren’t the best team on the road. Going out west isn’t the best in terms of rest, but at least it IS the Mariners, followed by Oakland and the Texas Rangers. Make sure to check the Rays page for standings, game info, and of course, our magic number countdown!! !